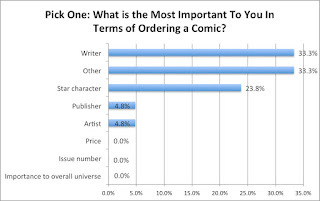 The above graph seems to indicate that when it comes to ordering a comic, for a retailer the most important aspect is the writer of the book, with one-third indicating as such. Compare that to the 4.8% of retailers indicating that the artist was most important and you’ve essentially got fuel for an ongoing creative fire. There’s seemingly more to the graph than simply saying writers sell books and artists aren’t worth the looks. First of all, the most obvious thing to take note of here is basic statistics. Only 25 retailers participated in the survey, something that even Sktchd acknowledged as being a small cross-section. For anyone who hasn’t taken a stats class (or just forgot most of it), you typically want at least 30 respondents to get a number you can actually “rely” on. And even then you’re not really getting anything concrete. This certainly isn’t a knock against Sktchd, but it does caveat the data to an extent. Once you realize that it’s only 25 respondents, the percentages seem a little less daunting. The “Other” response could also have to do with the fact that there are quite a few books out there today where the artist is also the writer. Sktchd conducted a separate survey of artists recently and one of the questions asked was “Your position is primarily…” In the chart below, it’s revealed that of the 186 respondents, nearly half (79) of the respondents identify themselves as both the writer AND the artist. Some of those individuals could easily be identified in either the “Writer,” “Other” or “Artist” categories referenced above. 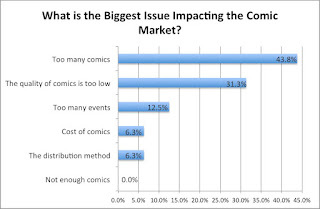 Many of the respondents indicated that the “Too many comics” response has mostly everything to do with Marvel and DC churning out a ton of books, drowning out the smaller ones. And this is where their success is really hurting artists. 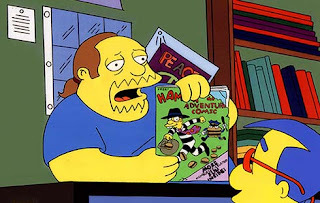 It’s possible that many of the new readers surging into comic book stores are doing so on the backs of just about any movie in the Marvel Cinematic Universe or from big-name shows such as The Walking Dead. In the case of the former, new fans already know what their characters look like and they want to know more about their pasts, which is why a retailer may indicate that the writer is more important. In the case of the latter, the writer’s name (Robert Kirkman) is plastered alongside The Walking Dead with little attribution offered to the artists (and co-creators), creating the association between the two that’s almost unbreakable. Geoff Johns is overseeing many of the DC film and TV projects. Stan Lee is largely viewed as the godfather of comics today, even though he was really more at the right place at the right time as the industry blossomed in the 50s/60s/70s. The big connection shared by those individuals is that they’re primarily writers and—to consumers/readers—they’re the ones responsible for crafting these elaborate universes. And in the end, it’s really the consumer the retailers are going after first and foremost. If those consumers aren’t walking in the doors, then the retailers are going to be closing theirs. 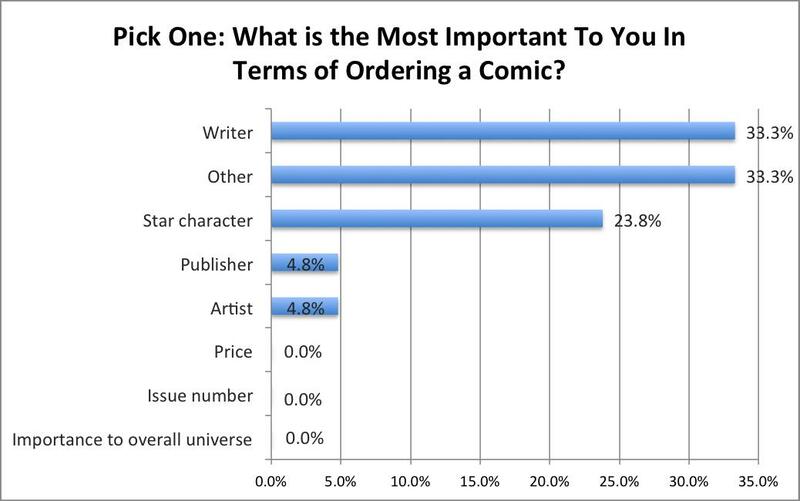 It’s wholly possible that when retailers answered the survey about what they think is most important in terms of ordering a comic they were approaching the question from a financial standpoint. As in, when you’re ordering product to sell to customers, what do you think is most important in making sales. The sad truth is that most readers assume that the writer is the more important part of the creative process, simply because in the mind of the average reader, the writer is the brains behind the entire operation. This isn’t written to discount or discredit any artist who feels their work isn’t appreciated. Instead, this is written merely to attempt to soothe some of the conflict surrounding what artists may perceive as another slap in the face. It’s wholly possible that some or all of the retailers who chose “Writer” did so because they genuinely believe the writer is the most important person in the comic book collaboration process. 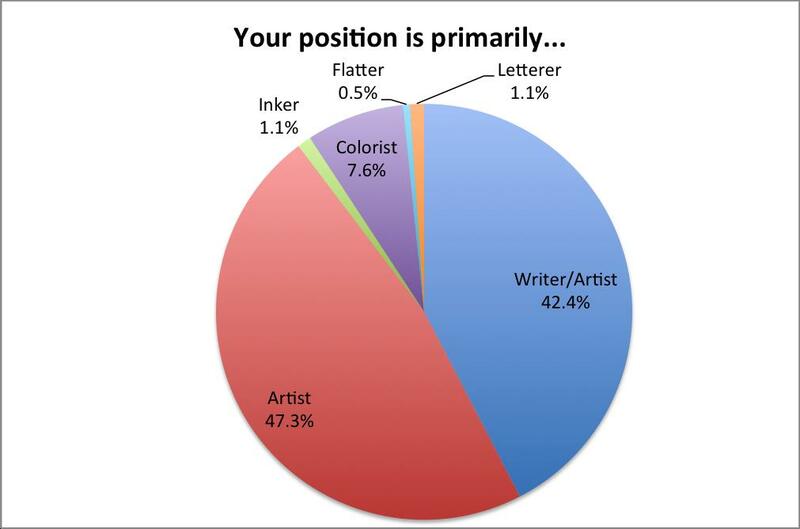 It’s also possible though that “Other” and “Artist” choices combine to reflect the writer/artist combination, in which case that number would exceed that of the “Writer” responses. Having said all that, there is clearly a disparity in recognition between writers and artists. There are many writers who go to great lengths to ensure the artists they collaborate with get full credit and there are some who don’t. The entire existence of comic books wouldn’t exist without artists, so there should definitely be more attention paid to them as part of the creative process. The fact that many artists can’t make a living solely on their art in comics is a little appalling and speaks to the perversion of a time spent to reward ratio. An artist is much like a director in a comic book, as it’s more often than not their interpretation of the script that ends up being the final, visual representation of it. Reviewers should also go to greater lengths to analyze the art with the same scrutiny that they analyze the plot and dialogue. The truth of the matter is that art is so much more nuanced than writing that it’s difficult for most reviewers to offer up a comprehensive review that doesn’t sound uninformed or uneducated. That doesn’t excuse reviewers from including critiques of the art in their reviews, but it does make it more difficult to write a sound review. Reviewers could do well to brush up on some of the artistic terms and styles as a means of critiquing the work. This would also serve to shine a light further on the actual work that goes into a book from an artistic standpoint. Publishers could probably do more in advertising their books. Because the artwork side of things typically takes longer, a major publisher will generally advertise a new book with the writer's name and the artist TBA. While it makes sense from a business perspective for the publisher, it does nothing for the artist that's eventually named on the book. With the explosion of comics as a viable business strategy for multiple arms of advertising (movies, toys, clothing, etc. ), the perception is likely that the story is more important than the art. That essentially commoditizes the artists much like animated films. You could probably ask ten people on the street to name one artist working at Pixar and it's likely none of them would answer; yet, they could probably recite lines from the film. And with Marvel owned by Disney and DC owned by Warner Bros., the emphasis is being placed on riveting stories as the hook and artwork as interchangeable. At the end of the day, there remains a perceived (and well-deserved) slight on the part of many artists, courtesy of publishers, retailers, writers and readers. Artists should get all the credit they deserve and more, especially when there are so many top-notch artists in the game today offering up a wonderful myriad of styles. Retailers probably know this more than anyone, which is why it’s unfortunate that everyone’s gravitating towards that one chart in the Sktchd survey. Retailers are one of the most important pieces of the comics puzzle and they have to walk a fine line between pushing artists as much as possible and selecting the books that will carry their stores. 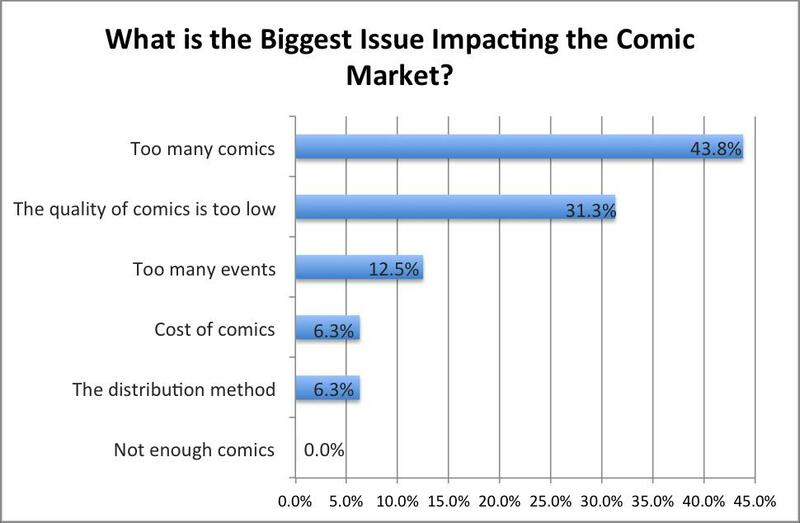 The biggest issue for artists getting credit right now is most likely the marketing machine that comics have become.